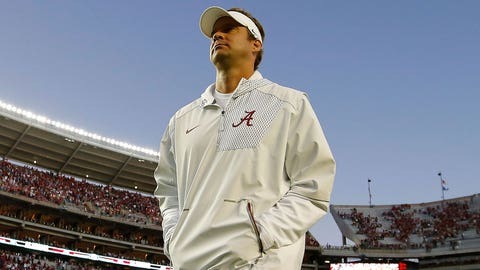 Lane Kiffin rose to prominence with USC, where he was offensive coordinator in 2005-2006 and was the wide receivers coach the previous year during the Trojans' run to a since-vacated national title. A highly coveted coach, in 2007 he made the unusual jump straight from college coordinator to NFL head coach when he was hired by the Oakland Raiders. 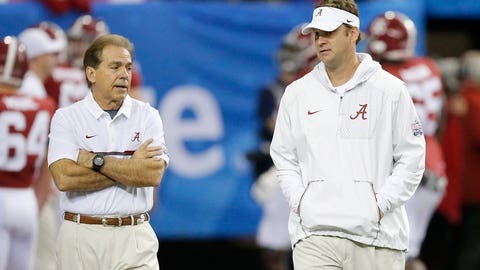 Since then, every stop on Kiffin's coaching journey has been marked by memorable — in some cases, utterly unfortgettable — contentious exits, the most recent of which came on Monday. Take a look back at Kiffin's high-profile departures. 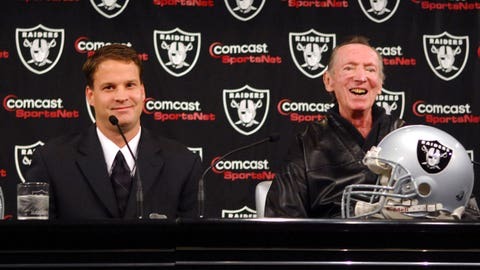 Kiffin's brief tenure with the Raiders was pretty much doomed from the start — he opposed owner Al Davis' desire to select JaMarcus Russell with the first overall pick in the 2007 draft. Though history would eventually prove Kiffin right about Russell, a 4-12 debut season tested Davis' patience. After a 1-3 start to 2008, Davis fired Kiffin over the telephone, then called a bizarre press conference where he presented via overhead projected a critical letter he had sent Kiffin. Davis fired many barbs at Kiffin during the lengthy press conference, calling his fired coach a "flat-out liar" and saying he was "embarrassed" to watch his own team play while also revealing Kiffin's disapproval of the Russell move. 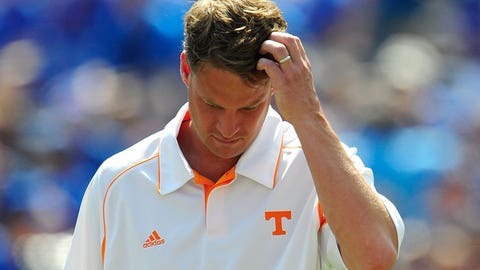 It didn't take Kiffin long to land back on his feet — he was named Tennessee's new head coach in late December 2008, replacing the legendary Phillip Fulmer. No easy feat. Kiffin finished his first season 7-6 — an improvement over Fulmer's 5-7 the year before but still a far cry from where the program was accustomed to being. As recruiting season ramped up in January 2010, Kiffin unexpectedly and suddenly announced he was leaving to return to USC to be its head coach. The news angered many fans and caused students to burn mattresses and gather around the athletic facility in protest. In a pinch, Tennessee brought in Derek Dooley as recruits fled and scholarshipped athletes transferred. The Vols suffered three sub-.500 seasons before Dooley was replaced by Butch Jones as the program continues to work its way back. So Kiffin was back home, with the program that launched him to stardom. Things started well in Southern California, as Kiffin went 8-5 and then 10-2 in his first two seasons with a program still dealing with bowl and scholarship sanctions as a result of the Reggie Bush scandal. But the Trojans regressed, going 7-6 in Kiffin's third season. After a 3-1 start to his fourth season, USC traveled to Phoenix for a date with Arizona State. The Sun Devils ran roughshod over USC, scoring 62 points in a win. After the team flight landed back in Los Angeles that night, athletic director Pat Haden pulled Kiffin into a room at the terminal and fired him on the spot in one of the most publicized coaching dismissals in recent memory. After the downfall at USC, it was unclear where or when Kiffin's next opportunity would come. It came from the opportunistic Nick Saban, who made him Alabama's offensive coordinator in 2014. Kiffin presided over the offense of three consecutive playoff-bound teams, but after the 2016 regular season, Kiffin accepted another head-coaching gig, this time at Florida Atlantic. He was set to stay on with Alabama through the playoff, but after taking heavy criticism for his performance in the Tide's semifinal win over Washington, Saban — in a stunning move, given the stakes and circumstances — decided to part ways with Kiffin, with Steve Sarkisian assuming offensive coordinator duties just one week before the national championship game.